You can Special Summon this card (from your hand) by banishing 2 Dragon-Type monsters in your Graveyard. Once per turn: You can discard 1 card; Special Summon 1 Dragon-Type monster from your hand or Graveyard. It cannot attack this turn and its effects are negated. When a Dragon-Type monster attacks a Defense Position monster, it inflicts Piercing Damage. You can only control 1 "Night Dragon Lancer". Edited by Sakura Haruno, 04 October 2013 - 04:42 PM. Even now, I'm still trying to get used to the new OCG and how it's worded. But thanks for the comment though; glad that you like it. Can - may, same diff. Overall a fun card! I'll update that part later on tomorrow; considering it's quarter to midnight for me when I'm typing this reply. As I mentioned in the 1st post, it's designed to be a version of REDMD that doesn't get hit by the ban lists and cause OTK combos, etc. but have something that differentiates it from being a copy of said card. You're both wrong. It's supposed to be "You can Special Summon this card (from your hand) by blah blah blah..."
Anyways, this thing probably makes Dragon rulers Tier 0 again, so that's already screaming horrible design to me. This thing allows you to make Rank 7 Xyzs exceptionally easily, into a Big Eye to turn the game into your favour, or Draccosack to deal damage to the board. Really, anything that involves Dragons nowadays probably indirectly supports Dragon Rulers, but getting a +2 off dropping this card is just bad design. And then leads to further spam if you manage to dump Redox, Blaster, Tidal, Tempest, etc. It's LIGHT for chaos shenanigans, which means the Deck can now run BLS and Chaos Sorcerer for even more Banishing (Big Eye is DARK). It's just......bad design in a format which is dominated solely by Dragon Rulers. For the reasons that Arin said, you should make it a level six or eight so it can't be abused as much, and for the special summoning effect, give it a cost. Looks like it'll combo very well with Elemental Dragons. Fortunately, only one of their "on-banish" effects will activate due to how they're worded, and they cannot search this card. On the other hand, read Arin's post. "Once per turn: You can discard 1 card; Special Summon 1 Dragon-Type monster from your hand or Graveyard. It cannot attack this turn." Here's the problem... It's like you said, all Dragon support is Ruler support. But on the other hand how many Decks have you seen run the far superior RedMD? That's the other thing to look at. So why would they run a less powerful version of RedMD? REDRUM doesn't allow Rank 7 plays without having to wait a turn. Have you played a Dragon Ruler deck before? They can pull out 2 Dragon Ruler's in seconds plus the ability to Banish 1 for RedMD and get that Ruler's effect. Plus it can Special a Ruler from hand, then another Ruler can Special itself by its eff and bang you got a Rank 7 Xyz. But we're not really talking about REDRUM here. We're talking about this card and how it easily makes Rank 7s in a conjoined effort with Dragon Rulers. Granted, they're (meaning Dragon Rulers) broken, but at the same time, Banishing 2 of their most valuable resources (for this card) to search stuff out makes it bad design. It's not about the fact that REDRUM can exploit it, or that Dragon Rulers can make Rank 7s in a heartbeat. I'm already aware of that. REDRUM is just icing on the cake. When you look at a card like this, you have to relate it to the next broken thing that correlates with it, and how well it does to dodge the effects of today's metagame. The trademark of making a good card and cardmaker in general, is to make something that doesn't boost any particular Deck, but has enough power and kick for it to stand on its own. But you're also expected to know what kind of cards are bad design and in which help boost broken decks to borderline "unplayable because they're God Tier" broken. Or cards that exploit the fundamentals of other cards and take advantage of that. It's much easier to ditch stuff from the Graveyard than it is from the field, because you don't want to give up precious field advantage, which is one of the reasons I personally dislike this card. So now I'm confused... Are you against Themes or something? Or just indirect support for themes? While I agree that it should be something like a Level 9, (Level 8 means it becomes easy Trade-In fodder if needed plus there are a lot of fairly broken/OP Rank 8 Xyz Monsters already...) I honestly don't see how other then being a Level 8 Monster how this will help the Rulers better then RedMD. This does seem to be a support of Chaos Dragons to be honest either that or generic Dragon support. It's hard to not indirectly support something, which is why I made the earlier remark on "The trademark of making a good card and cardmaker in general, is to make something that doesn't boost any particular Deck, but has enough power and kick for it to stand on its own." In that case, it would be the latter. I would make it Level 6 or something, honestly. How about if I change it to WIND or something; though it conflicts with its naming [I didn't particularly make this so Dragon Rulers have something else to spam, but in this case, looks like that]. (I originally was going to negate the summoned monster's effect; would that have done much). I don't play Dragon Rulers/pay attention to metagame, so I didn't account for this card fueling their deck style or any future plays. I'll make it Level 6 then. As for the Special Summon effect, there is a discard cost for it + monster can't attack this turn (What else did you have in mind? ); unless this refers to this card's SS itself. Or I can just make this card a monster version of Dragon's Rage and remove the SS effect altogether. Level 9 would be better so then it's still a 2 Tribute Monster to Normal Summon but doesn't help Dragon Rulers or generic Level 8 decks. I think the attribute is fine as the number 1 deck that would play this is Chaos Dragon's as the Ruler's can't use it in their effects except to Special themselves. I'm not going to make it Level 10 like Metal, otherwise you get this card with it; Xyz for Gustav; which I saw in the suggested build for decks revolving around it on the Wikia. Level 9 should work, though the stats will be under average for something of that Level (but the effects balance that out anyway; much like how 2800 isn't that much for a Level 10). I did add the effect that summoned monster will have effects negated. For attribute, yeah Chaos Dragons would the only ones using it most of the time if I kept it as LIGHT (considering that WIND doesn't really fit a monster named "Night" Dragon ...) Though I have to consider Arin's post as well. I changed it to WIND in the first place so it wouldn't help Chaos Dragons/BLS as much. Anyway, I returned the attribute to LIGHT and raised its Level to 9 like you suggested. Edited by Sakura Haruno, 04 October 2013 - 04:38 PM. When I said, add a cost, it was when it could be abused by dragon rulers because discarding a card helps them get their dragons in the graveyard, plus they have a bunch of draw cards anyways. I know this only from playing against them and what my brother has said about them, I don't care about them anyways. Let's try making that discard cost into a banish one instead (DRs shouldn't be able to use their effects with this card; unless you use Burial from Different Dimension/Miracle Dig/whatever to return them back to the graveyard, but don't really see them used; as far as I know). Though, I won't edit the card again until I hear your opinion. 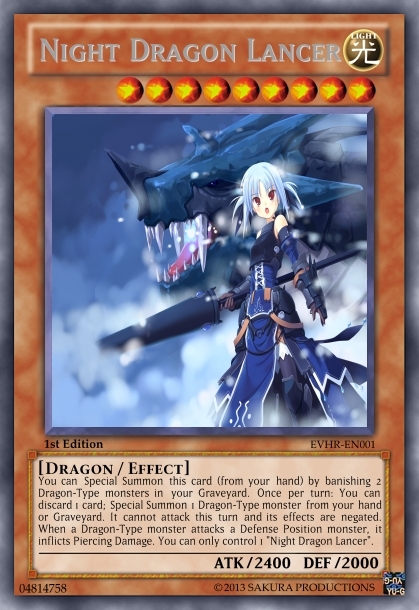 Though we can't edit this card's effect solely to deal with Dragon Rulers; there are a lot of other cards that can abuse this card so need to keep that in mind also. I have to admit that this got a lot more activity than I originally expected; considering that I'm not exactly well-known in this section. Thanks for all the comments thus far that were directed towards fixing this to make it less abusable by certain cards. No, Discarding a Card is fine. Banishing means the Ruler's will be able to search. @Lucus: This will inevitably help Dragon Rulers in some way, but the thing is, Dragon Rulers will most likely not use it. They don't even use RedMD currently so why would they use this?